Professional Supplement Center is pleased to announce the addition of a line of unique premium natural products from Manuka Health. 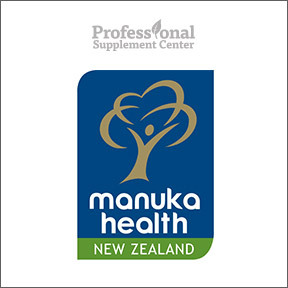 Based in Te Awamutu, New Zealand, Manuka Health is dedicated to providing high quality MGO™ Manuka honey and Propolis™ products that harness some of nature’s best scientifically proven bioactive compounds garnered from New Zealand’s native flora and fauna. Manuka honey has powerful germ killing properties and is used in hospitals worldwide for treatment of antibiotic-resistant superbugs. Manuka Health established a precise, scientific certification system for New Zealand Manuka Honey based on the concentration of the naturally occurring compound, methylglyoxal. The unique concentration of methylglyoxal contributes to the characteristics of Manuka honey and sets it apart from other honeys. Methylglyoxal honey testing is now a recognized standard for producers of Manuka honey. Working in conjunction with scientists, Manuka Health also pioneered the process of extracting and measuring the beneficial compounds of BIO New Zealand Propolis™, making it the world’s first propolis with certified levels of bioactives. Manuka Health develops, manufactures and markets their own products to assure quality control and traceability from beehive to shelf. All raw materials meet rigorous standards of quality and safety to ensure bioactive compound levels are maintained. Every batch of MGO™ Manuka and BIO New Zealand Propolis™ is tested in their ISO certified in-house laboratory. Only the most sustainable practices are utilized in beekeeping, harvesting and processing to minimize the impact on the honey bees and the beautiful, unique and pristine countryside. MGO™ 250+ Manuka Honey – This 100% pure Manuka honey is certified to contain a minimum of 250 mg/kg of methylglyoxal, a naturally occurring compound with high levels of antibacterial and antioxidant properties. This delicious honey has other healing health benefits and is helpful for sore throats, intestinal distress, wound surface healing, energy support and general wellness. Manuka Honey and Propolis Suckles MGO™ 400+ – This combination of high grade Manuka honey and Bio30™ New Zealand Propolis is naturally flavored with lemon oil and contains high levels of bioflavonoids, a natural source of antioxidants. Individually wrapped lozenges. Suitable for adults and children over 6 years of age. ManukaClear™ Intensive BB Gel – This ultra high grade MGO™ 600+ Manuka honey-based 100% natural proprietary formula helps clear trouble prone skin, smooth skin texture and maintain healthy looking skin. Non-drying, fragrance, chemical and preservative free, Non-GMO. Manuka Honey Suckles – Lemon MGO™ 400+ – These soothing honey and lemon lozenges contain high grade Manuka honey flavored with natural lemon oil. Individually wrapped and suitable for adults and children over 6 years of age. This entry was posted in Home and tagged Manuka Health, Manuka Honey and Propolis Suckles MGO™ 400, Manuka Honey Suckles - Lemon MGO™ 400+, ManukaClear™ Intensive BB Gel, MGO™ 250+ Manuka Honey. Bookmark the permalink.